Every ten years, from 1906 to 1936, the US Census Bureau compiled a Census of Religious Bodies. These censuses are gold mines of information on early American Orthodoxy. Also, unlike so many of the inflated numbers that you’re likely to see floating around, the census data is reliable. With its considerable resources, the Census Bureau was able not only to work with the jurisdictions themselves, but to contact individual parishes for precise information. The result is a thorough, well-researched, and generally unbiased collection of statistics and other information. By 1936, every group was between 42 and 51 percent female. For most of this period, the Greeks were the most overwhelmingly male jurisdiction (with female percentages from 1906-36 of 6, 17, 34, and 43 percent). Until ’36, the Syrians were the most balanced group, with 40% women in 1906, and 45, 49, and 47 percent in the years that followed. The census also kept data on Sunday schools. In 1906, there were just 7 Sunday schools in all of American Orthodoxy. By 1916, there were 162 (of which 126 were Russian). 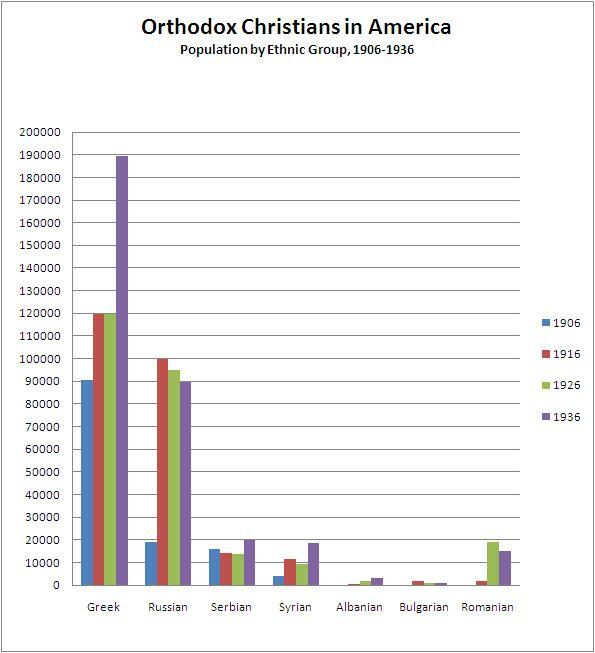 The Russians actually closed a lot of their Sunday schools in the next decade (dropping to 90), but the Greeks and Romanians added a lot more, pushing the total number up to 198 by 1926. By 1936, there were 294 Orthodox Sunday schools in the United States, of which 129 were Greek and 101 were Russian. I’ve barely scratched the surface of what’s available in the censuses. In the future, we’ll continue to unpack the data. I’d love to see the actual data. Have you published it somewhere that i’m not seeing? All the data comes from the Censuses of Religious Bodies, conducted by the US Census Bureau in 1906, 1916, 1926, and 1936. All but the 1926 Census are fully digitized and available online (the ’26 Census is, as best I can tell, only partially digitized). However, you can see the ’26 data (as well as data from ’06 and ’16) in the 1936 Census, which you can access by clicking here. The different years are available on various websites — the Census Bureau site, Google Books, and the Internet Archive (archive.org), I think.